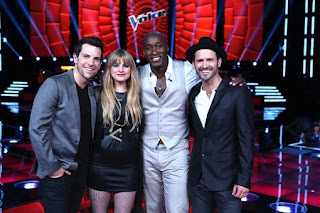 XOXO Jes - Canadian Entertainment News: Who will win The Voice? The Voice had it's final singing night tonight. How will the dice land once all of the votes are counted? Should Win: Juliet Simms. The girl has a killer voice, but as the votes seem to be going to the men this season it is not looking too great for her. She also was supposedly singing sick...not on her a game. But she was still pretty good with Free Bird. Will Win: TOUGH. I think it is a toss up between Chris Mann and Tony Luca. I was thinking it was going to be Tony...but Chris pull out some pretty big songs and Tony did flubb through his rendition of Harder to Breath. What a diss to Maroon 5. Can't believe they made it this far: Jermain Paul. I am sad that Team Blake has no chance here. He ended up with the one singer who has a good pitch, but can never get on top of the big parts. He always sounds like he is reaching and it gives me pain. Listen to the climax of I Believe I can Fly...it shouldn't be that difficult. The biggest surprise of the night would have to be Tony Luca. I loved his version of 99 Problems, his duet with Adam was dope....and then it all went to hell with Harder to Breath, but people may remember only the good? Maybe...I would still put money on the former Mouseketeer. Tomorrow night all shall be revealed.